Deacon Elaine Clements reflects on the flood relief and recovery in the Episcopal Diocese of Louisiana five months after the devastating floods of August 2016. The single mom had three children and another on the way when she lost her home in the flooding in Louisiana in August 2016. When she had to move from one community to another because her home flooded and she couldn’t find another affordable rental near where she lived, the Episcopal Church was there to help with rental assistance and utility deposits. At Christmas, they were there to help with clothes and toys. Another woman, middle-aged, a classroom assistant in a local public school, had eight feet of water in her home. She was no stranger to trouble; her daughter had died last year, way too young. She had no flood insurance; she had never flooded and never expected to. A contractor took the money she managed to get together from FEMA and did a little work, then quit, leaving her with a home in ruins and very little done. The Episcopal Church was there to help with volunteers, building materials, and appliances. She has Bible scriptures written on the bare studs of her walls where they are disappearing every day, behind the sheetrock that is going up in her house. The recovery work in the Episcopal Diocese of Louisiana for the Baton Rouge area floods of August 2016 is ongoing. To date, four grants to support the work have been received by the Diocese from Episcopal Relief and Development, two totaling $40,000 were quickly spent on gift cards and immediate needs assistance in the first month after the floods. The third grant, for $100,000, met the needs of the program through the end of 2016. A new grant, for $400,000, has been awarded for 2017. In addition, the Bishop’s Fund, maintained by Bishop Thompson, has provided rental assistance and utility deposits, serving thirteen families in need. These families came from St. Francisville, Baton Rouge, Zachary, Clinton, Jackson and Greenwell Springs, so a wide swath of the flooded area. The fund has also provided $50,000 for building materials, mostly sheetrock and appliances. The Bishop’s Fund will also assist the Episcopal Churches impacted by the floods. The Bishop’s Fund just this month received a donation of over $50,000 when St. James in Baton Rouge arranged for Dr. Brené Brown, a popular author and speaker, to donate her time for an event. Five hundred tickets were sold at $100 each, all proceeds donated to The Bishop’s Fund for disaster relief. In addition, the Diocese received thousands of dollars in gift cards and other donated goods, all of which were distributed through our parish churches to survivors of the flooding. Through the network of Episcopal Relief and Development trained Diocesan Disaster Coordinators, the Diocese of Texas, Mississippi, Central Gulf Coast and Alabama have donated (and kindly drove to us!) church tents/church in a box, shower trailers and tool trailers that we are still using in the relief effort in addition to all the gift cards and other goods that they sent. [Photographs by the Rev. Canon Shannon Manning] Dr. Brené Brown generously donated her time for an event at and organized by St. James Church, Baton Rouge, to support Louisiana Flood Relief. Originally, the program had many components. Nearly all of our churches reached out in ways that they could—New Orleans and Jefferson sent teams of volunteers, the Northshore collected food and other needed supplies among other things, Baton Rouge dove in right where they were to help by using what they had. Almost immediately, the Dean of the Baton Rouge Deanery, the Very Rev. Dr. Roman Roldan, began to coordinate the parishes in a mucking out and rebuilding operation, and it is that program, which covers the whole disaster area, that is now being funded by the Episcopal Relief and Development grants. To date, forty vulnerable families have received building materials, appliances, and other necessary items through this program. Homes in need of gutting are still being identified and there is a waiting list on the program of over 100 families. Volunteer teams from a number of colleges as well as individual teams from Vermont, New York, and South Carolina have been hosted with Grace, St. Francisville, providing housing and meals. More volunteers are scheduled to come in the spring. 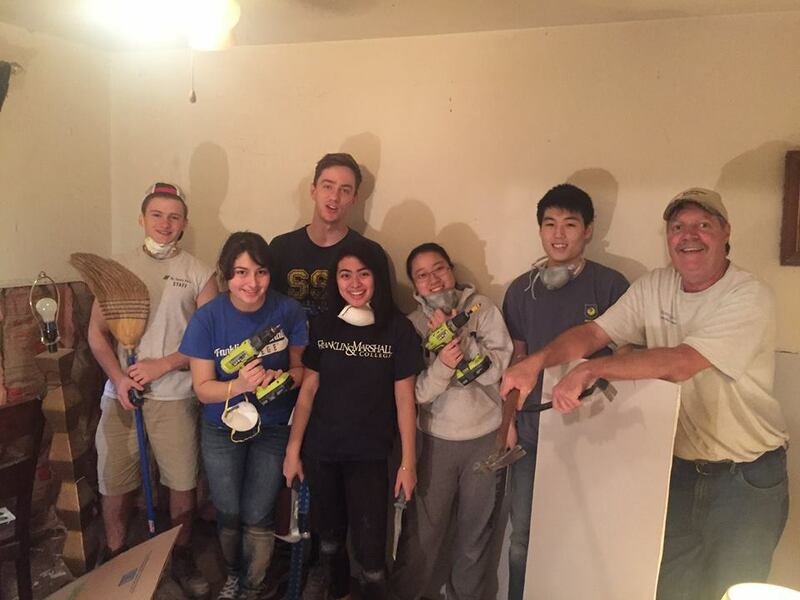 [Photograph courtesy of Grace Church, St. Francisville] A team of volunteers from Franklin & Marshall College, Lancaster, Pennsylvania, spent a week of their 2016 winter break working in Louisiana to assist with the rebuilding of flood-damaged houses. Because Father Roldan and Father Kang in St. Francisville have donated their time, thanks to the kindness and understanding of Grace’s parishioners, only one person has been hired, a part-time assistant, thus allowing overhead to remain at less than 5% of the total program. Beginning in January, the grant will allow this position to become full-time so that Father Roldan and Father Kang may return full-time to their duties at Grace Church. Father Roldan will continue to supervise and coordinate the program, however. Even with the full-time position, the overhead costs for this program will be less than 10% of the total program, an amazing accomplishment. We remain committed to keeping the overhead costs low so that the bulk of monies can be given directly to flood survivors for owner-supervised rebuilding/repairs, utilizing when possible, volunteers to do the work. Visitors from Episcopal Relief & Development and dioceses affected by Hurricane Matthew listen to Father Roman Roldan and his assistant Meg Kendrick talk about the flood recovery program at Grace Church and in the Diocese of Louisiana. 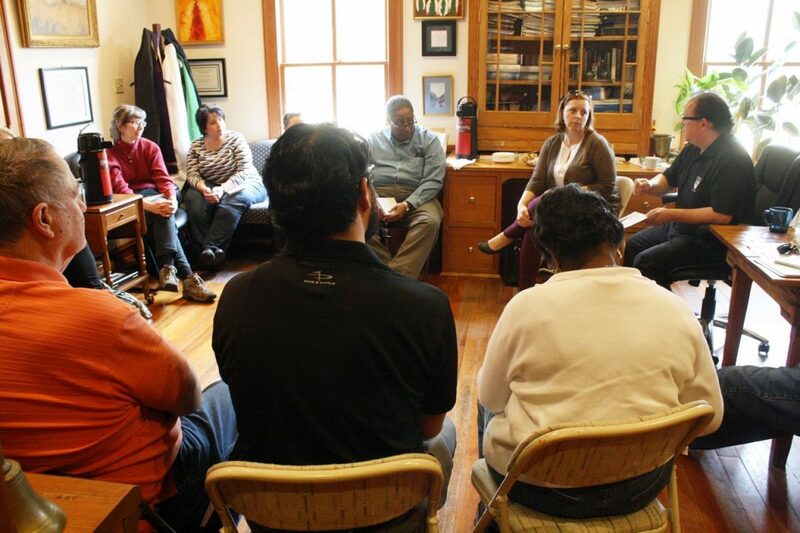 Recently, Hurricane Matthew affected dioceses came to Louisiana so that they might observe the long-term recovery program being operated here and be trained in how to utilize their own gifts, matching them to local needs, so that they might return to create long-term recovery programs of their own. The program developed in Louisiana is considered in many ways to be a “best practices model” in recovery. We’ve made some mistakes, of course, and learned some lessons but that will always be the case because every disaster is different. As we say, “when you’ve seen one disaster, you’ve seen one disaster”.